Experience the brilliance of this wild, versatile quad octave pedal. 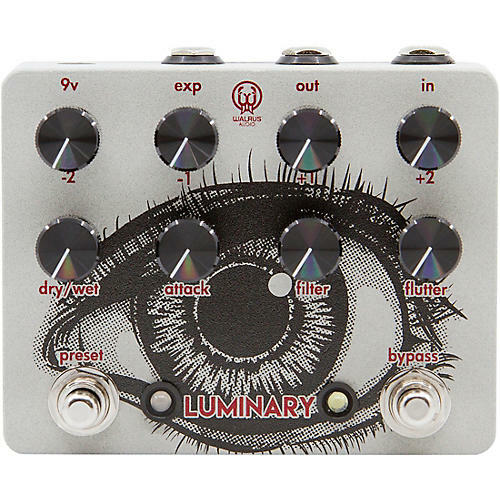 The Walrus Audio Luminary V2 polyphonic quad octave generator pedal operates on the Analog Devices Sharc platform. The Luminary V2 gives you the ability to create combinations of four separate octaves, including -2, -1, +1, and +2 octaves. Guitarists can craft many different layered sounds and textures with crystal-clear and immediate octave tracking. The Walrus Audio Luminary V2 has three onboard presets for saving sounds, as a well as live mode for accessing up to four custom sounds at any moment. Get epic steel sounds with the modulation control disengaged. You'll find more experimental options with the filter control or a swirling chorus with the tremolo control. Couple the Walrus Audio Luminary V2 with an expression pedal to expand its creativity even more. The four knobs across the top of the Walrus Audio Luminary V2 pedal control the level of each octave. Set the Dry/Wet control between minimum and 12 o'clock to keep the octave signal lower than your dry signal for a subtle effect. Or, set it between 12 o'clock and maximum to keep your dry signal lower than unity for a boastful octave sound. Dimensions: 4.67" x 3.68" x 1.547"